Assign and select menu forms enhanced to allow them to remain open for repetitive use with a new apply button. DirectX graphics mode enhanced to use DirectX 11 for enhanced speed and capabilities. A full 64-bit version of CSiBridge is now available. New 2-D modified Darwin-Pecknold concrete model added to the nonlinear layered shell. This model represents concrete compression, cracking, and shear behavior under both monotonic and cyclic loading, and accounts for crack rotation. New cable-stayed bridge template added. Additional frame and shell (non-bridge) templates added. Modify undeformed geometry feature enhanced to allow applying the modification to a selection of joints, as well as limiting the direction of modification. New construction scheduling wizard added for segmental bridges, allowing for quick and easy creation of a construction schedule, including travelers. 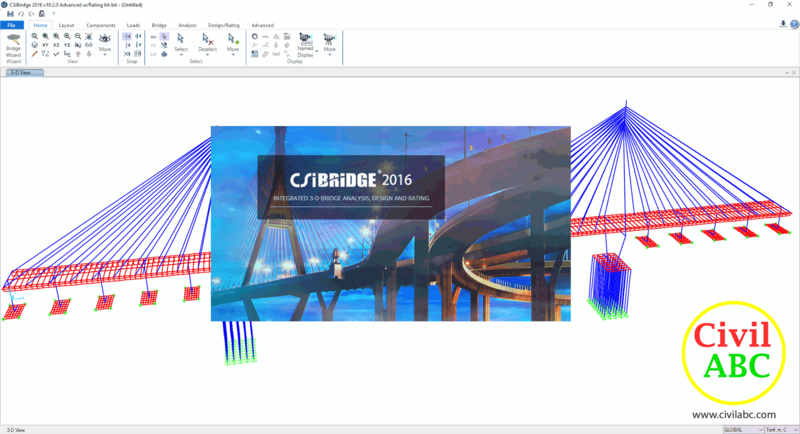 User-defined bridge sections can now be created and used in the bridge modeler, including different materials, openings, radii, parametric variations, and editing in Excel or section designer. Bridge modeler enhanced to more accurately define the geometry in the vicinity of a skewed support, diaphragm, or in-span hinge for curved bridges and/or parametric variations of the bridge section at the skew. AASHTO legal loads for load rating added to the vehicle library. A new stability check added for nonlinear static load cases to report when the structure may have failed under material or geometric nonlinearities that are not obvious from the analysis results. Handling of convergence tolerances for time-dependent behavior during staged-construction analysis improved to better enforce equilibrium after large load increments. Superstructure design according to CSA S6-14 added. It is now possible to specify the location of steel I-girder splices, including the net to gross area ratio of the flanges in order to perform the design checks at these locations using the reduced flange area. Superstructure design and rating of steel I-girder bridges according to AASHTO LRFD enhanced to consider a detailed calculation of the moment-gradient factor Cb. Contour plots now available for frame deflections and axial stresses. It is now possible to output the vehicle position for moving load analysis, for a specified max/min force component at a particular location. 11 Comments for "Download CSiBridge 2016 v18.2 (x86/x64) "